Photo shows a side-by-side comparison with one of our 15"x27" bags. Yes, they're bigger. 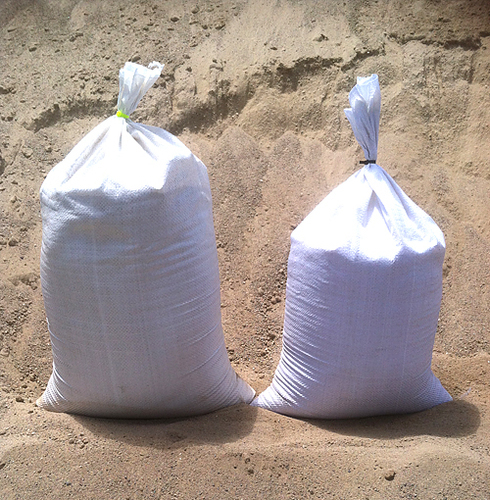 Other than size, the 18"x30" bags are identical; but they can hold nearly twice as much fill, up to 100 lbs. They have the same 1600 hour UV inhibitors & come with tie strings. Great for feed, compost, and storing or transporting commodities. For earthbag building, these bags can be a little hard to handle (averaging 50-75 lbs. when loosely filled with mud). But they have the advantage of being wider (18"), longer (about 21") & higher (up to 6"-8") once filled & tamped. You'll end up using fewer bags, yes. But if you're not in excellent shape, they'll wipe you out in no time.